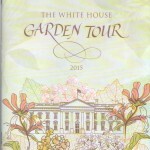 There are all the other garden tours, but in the Washington, D.C. area, the “Golden Ticket” of Springtime events is the White House Garden Tour. I was so lucky to get an invitation from a friend (thank you, Karen!) who got some of these hard-to-get, wonderful tickets, and want to share some highlights here on the blog. We had perfect weather — sunny and blue sky — and the gardens were beautiful. We were restricted to the pathways for security concerns, but even still, the views were breathtaking. Tulip border garden surrounding the press area. Oval Office in background. 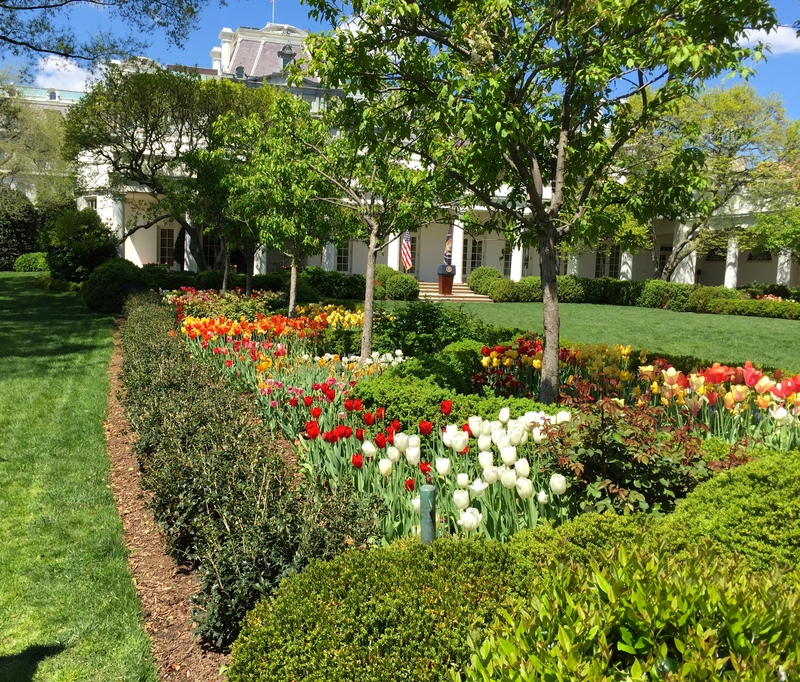 We had a great view of the Oval Office/press podium area which is bordered with the most beautiful tulip garden. No sighting of the President, but the White House Correspondents Dinner, otherwise known as the “Nerd Prom”, was held just the night before our tour. 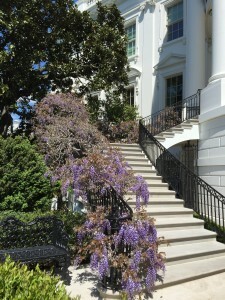 The wisteria on the stair rails of the south portico were in full bloom. 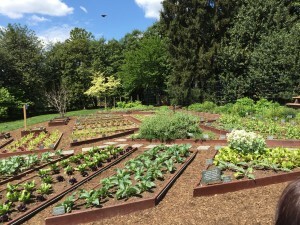 Michelle’s veggie garden is thriving! 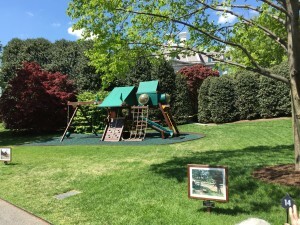 Of course, some of the newer highlights are the First Lady’s vegetable garden, and the first daughters’ swingset area. These were especially fun to see. I hadn’t been on this tour since way back in the 1980’s; this was all new to me! 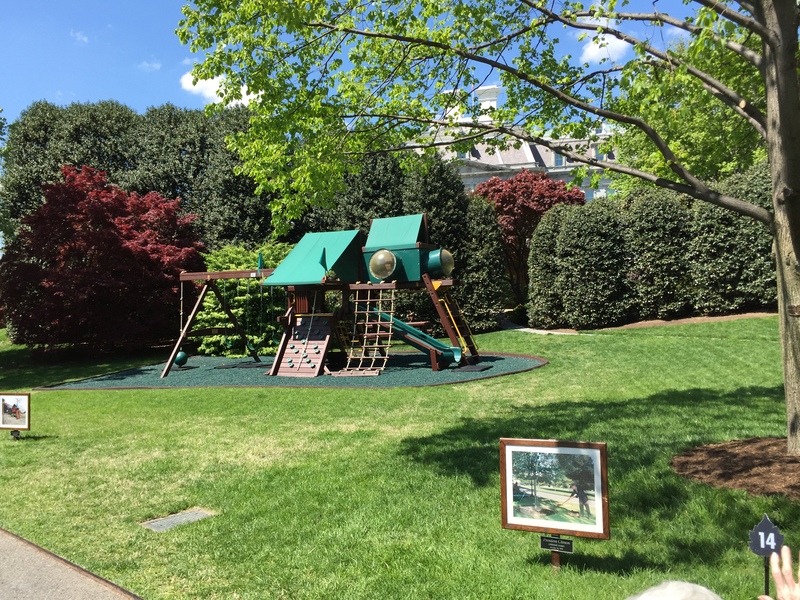 The first daughters’ swing set is right outside the Oval office. Must be comforting to look out and see kids playing while dealing with the country’s issues! And the views of the monuments in the distance are so magnificent from the White House gardens…. 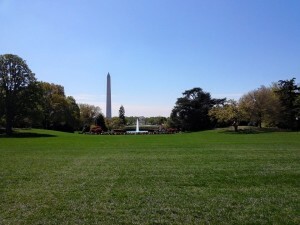 View from the White House south lawn looking at the Washington monument. 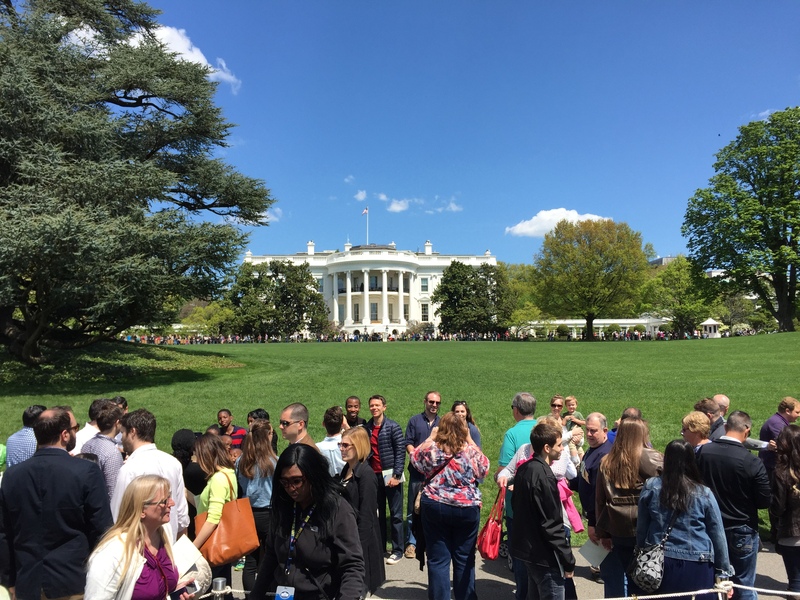 This is where the famous Easter Egg Roll happens the Monday after Easter. 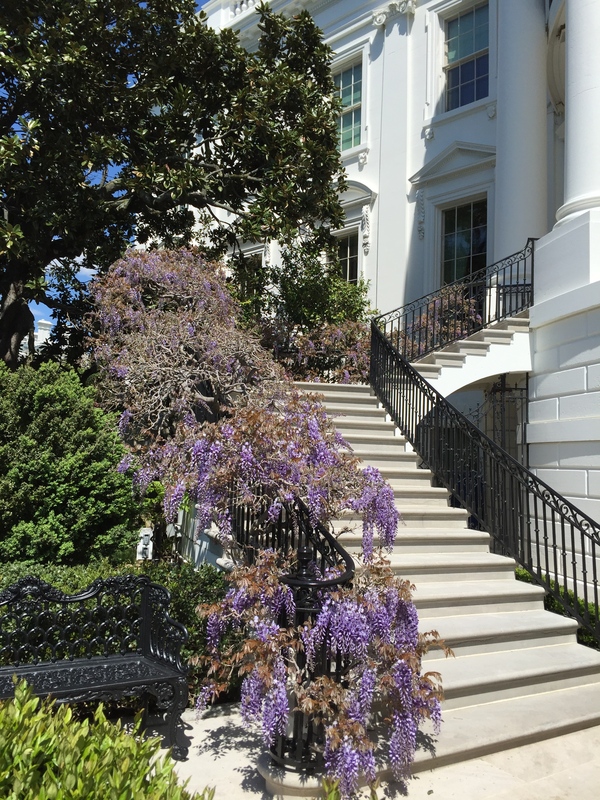 I’ll leave you with one last shot of our beautiful White House on such a gorgeous day. 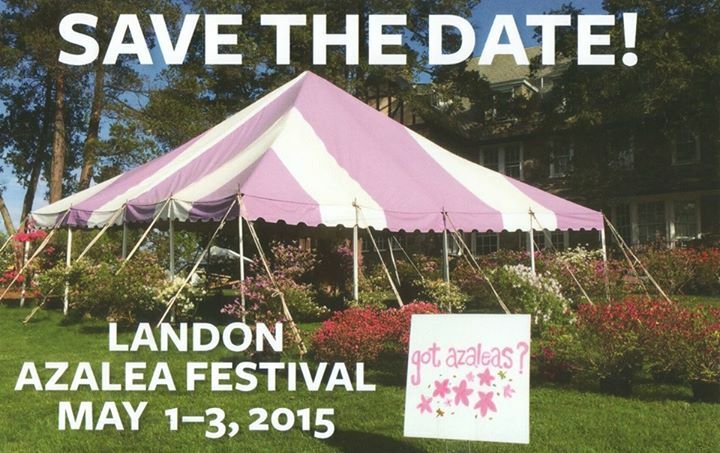 And now on to the next special event- — hope to see you there!